You may have seen this one already. Someone's flipping. It sold for $11K on eBay in September 2018. Listed in Atlanta, GA. Now is CO. I watch every listing for Comanche's. This is a particularly nice truck! 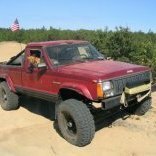 If someone wants a laugh, you should ask the seller to describe in detail how they did a "frame off" restoration on a Comanche. Any idea who makes those sliders with the rear hoop?